A study conducted shows that around 56 per cent of the passengers expressed their dissatisfaction over the quality of ferry service. KOCHI: Amidst the public outcry over the standards of water transport in the city in the wake of the tragedy that claimed took 11 lives last week, a study conducted by Kochi-based Centre for Public Policy Research on Inland Water Transport in Kochi in 2012-13 shows that around 56 per cent of the passengers expressed their dissatisfaction over the quality of ferry service. This includes five percent who were extremely dissatisfied with their experience. Another 29 per cent conceded that they were dissatisfied with the level of service delivery on the ferry system when another 22 per cent chose to remain neutral. However, only six percent of them had complaints over the safety of the vessels. Though the majority of those who use ferry service are from the lower strata of the society, 43 per cent of the passengers interviewed by the organisation favoured an increase in fare. The maximum number of samples were chosen from the routes such as Ernakulam-Fort Kochi, Ernakulam -Willingdon Island and Ernakulam-Vypeen as they are among the busiest travel routes. According to CPPR, the ferry service was used by 13,000 passengers on a daily basis and a sizeable 68 per cent of the ferry users interviewed had less than `10 as their monthly family income. This includes 19 per cent passengers whose monthly income fell below `5000. Also 40 per cent of the interviewees vouched that they did not own any vehicle with another 31 per cent owning just a cycle. The remaining 29 per cent owned either motorbikes or cars or autorickshaws. Around 53 per cent responses from amongst the interviewees contended that the frequency of services on various sectors was inadequate and far lesser than the existing demand. leading to modal shift among the users. The authorities had explained that there were not enough passengers for frequent services, some of them had been cancelled. As a result, people who turned up at odd timings had to wait for as much as 30 to 45 minutes to take the next ferry. 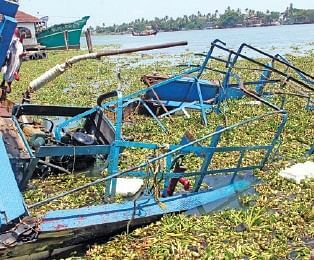 A forum of Vypeen islanders will conduct a sitin in front of the Kochi Corporation at 11 am on Thursday in protest against the apathy of the authorities in resuming the ferry service connecting Vypin and Fort Kochi, even a week after the boat tragedy. A meeting of the islanders on Wednesday criticised the authorities, especially Dominic Presentation MLA and Mayor Tony Chammany, for not keeping their word that the ferry service would be resumed from Monday. Johny Vypeen, Majnu Komath,Paul J Mampilly, PD Varghese, Rajgopal D Komath will address the gathering.